Outdoor play has almost become a lost cause. With so much technology at their fingertips, it is getting harder and harder to encourage kids to play outside. The result is kids who spend too much time in front of a screen, instead of interacting with others and getting exercise. If you want to encourage your kids to be more active outdoors, look at these 20 Ways to Make Outdoor Play a Priority for Kids! When you give these tips a try, you will find that kids will not just be more likely to head outdoors, but will prefer it! This list may contain affiliate links from Amazon. I earn a small commission through purchases made via these links. This list was shared with me by my good friend Katie from The Homespun Hydrangea. She always has amazing ideas and tips for getting and keeping kids active! 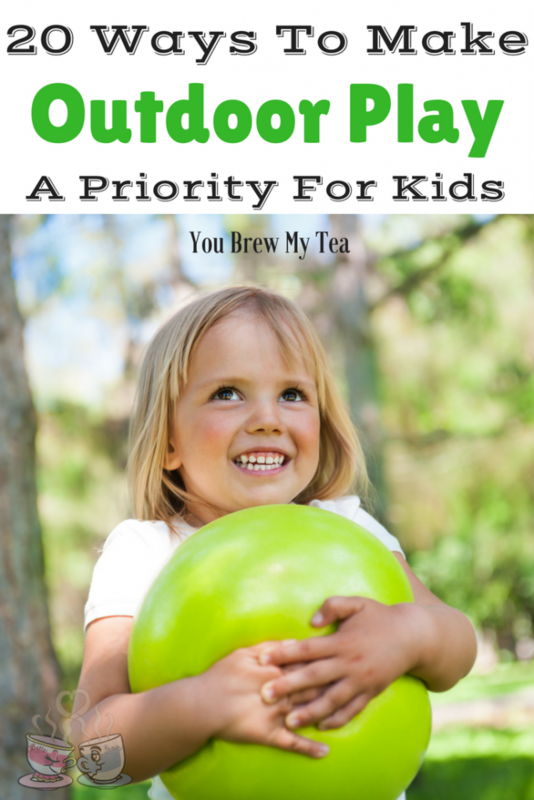 Her tips for outdoor play are perfect for keeping kids busy and healthy! 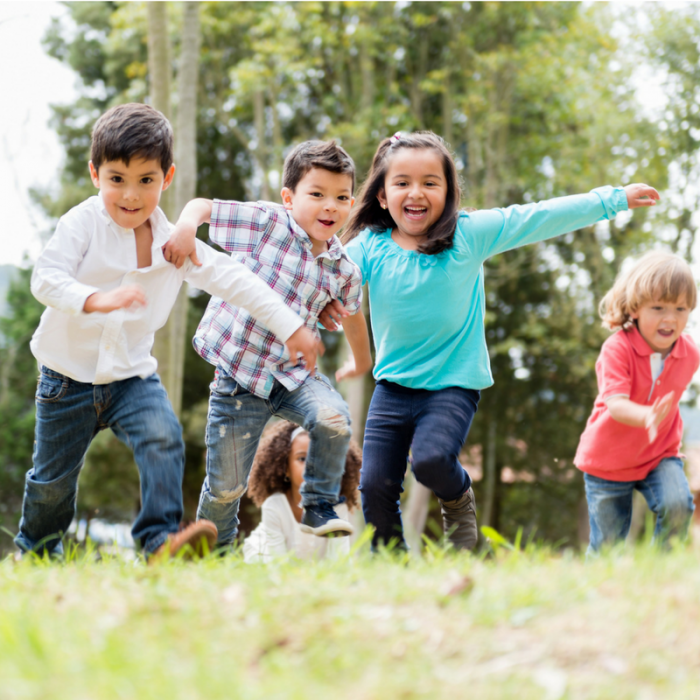 By limited tv time to an hour or so a day, you are encouraging kids to find other ways to entertain themselves, playing outside being the perfect option! If you are like me and work from home, you may get wrapped up in work and forget. I suggest using the alarm on your phone, or a simple kitchen timer. If kids see you enjoying the outdoors, they will be more likely to. Let them see you reading outside, doing yard work, and enjoying nature. Nature hikes or just walks around the neighborhood are great ways to get your kids involved. 3. Give them magnifying glasses. Kids love exploring nature with a magnifying glass. Find one from the local dollar store and let kids explore all that is in their own backyard. 4. Let them make their own bug catchers. Take plastic butter containers and poke holes in the lids. Let kids catch bugs and create a mini habitat for them. Let the bugs go at the end of the day. This is a great science lesson as well as a fun way to explore the outside world. 5. Download star finding apps. There are many apps that can help you locate stars and constellations. Download one of these apps so kids can explore the starry skies! Geocaching groups are all over the internet and a great way for kids to find hidden treasure! Join a geocaching club and see what you can dig up! Outdoor play is not just about specific organized sports. Geocaching is fun for the whole family! Visit local parks to enjoy their trails, nature centers, and of course outdoor equipment. It is a great way to stay active in a safe space. We love doing this on sunny days! Pack a picnic in a fun picnic basket and spend a few hours having fun! I love this Insulated Picnic Basket because it keeps cold items cold. 8. Keep a sprinkler on hand. Sprinklers are great for hot days, so keep one on hand. Kids will love running through the sprinkler or even using it to wash their bikes. I love this Geyser Blast Sprinkler! 9. Stock up on bubbles. Keep plenty of bubbles and wands on hand during the summer months. This way kids never run out of bubbles to blow. You can even hold bubble blowing contests. I love getting these large containers of bubbles. 10. Have fun with sidewalk chalk. Keep the sidewalk chalk stocked up so kids can make outlines of themselves and play hopscotch. 11. Subscribe to nature magazines. Nature magazines geared towards kids can help pique their interest and encourage them to be more active outdoors. 12. Encourage outside play with friends. 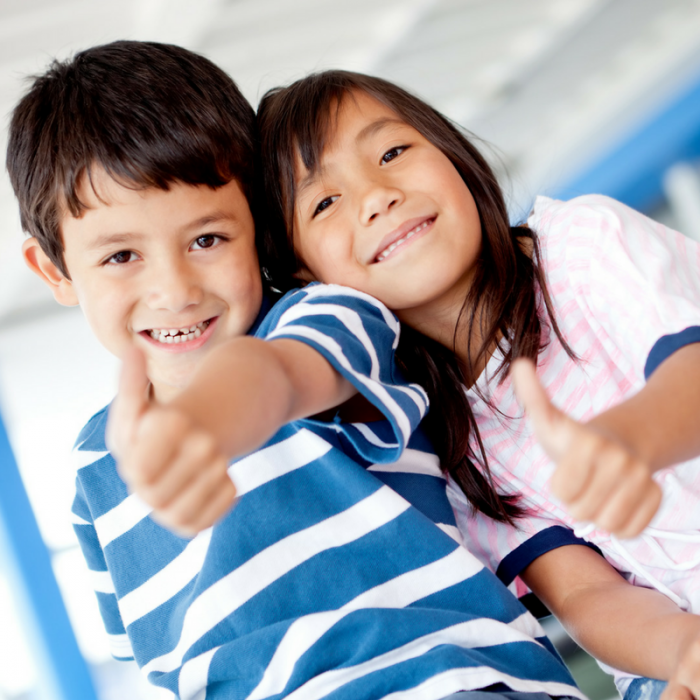 Make play dates with friends that encourage outdoor play such as basketball or bike riding. 13. Let them craft their own treasure hunt. Let kids bury their own treasure and create a map. Then, see if you can follow the map to find the treasure. 14. Keep bikes in working order. Keep bikes in working order (tires inflated, chains oiled) so kids can easily spend time riding bikes and getting plenty of exercises. Update your kid’s bicycle as needed so it fits them properly. 15. Try a game of flashlight tag. At night you can play a game of flashlight tag, perfect for getting exercise and enjoying the outdoors even after the sun goes down. 16. Hang a tire swing. Hanging a tire swing or investing in a swing can help kids not only feel more relaxed but helps them spend more time outdoors in the process. Make sure your kids have plenty of backyard shade so they are more apt to play outdoors. This will make it more comfortable for them and give them a place to take a break. There are so many outdoor sports to enjoy like basketball, tennis, soccer, and volleyball. Try out these sports and see which ones your child enjoys. There are tons of co-ed sports programs you can look into if your children have an aptitude for a specific sport. 19. Invest in a telescope. A telescope is a great way to explore the night skies! See if you can find used one at a reasonable rate so you can spend some time star gazing. This is one outdoor play option that is ideal for the whole family and is also educational. 20. Visit the community pool. Join a community pool so you have access to a pool during the hot summer months. Swimming is great exercise and a fun way to stay active! As you can see there are many ways to get kids excited about outdoor play and active. 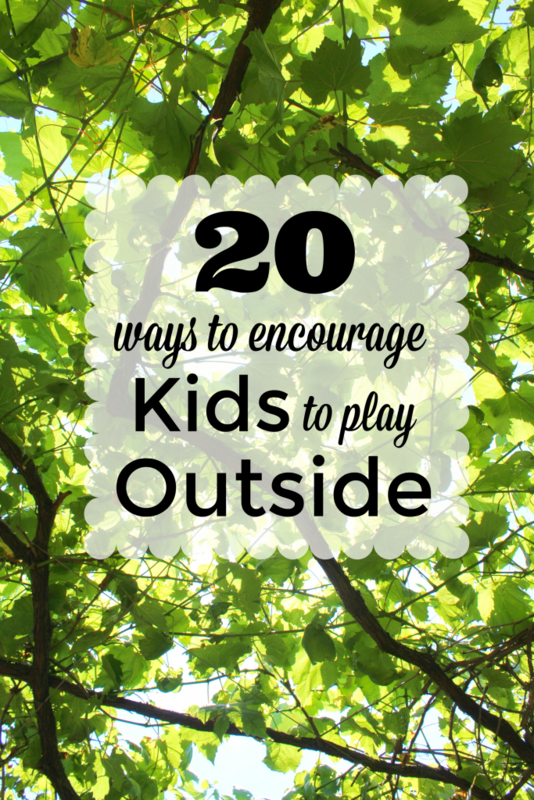 Consider these tips and ideas for getting your kids outside and having fun this summer!